Unfortunately I haven’t saved a Screenshot of the error Message. But I could not find any information on this topic. The only thing I was thinking about was: Why does the error tell me, that the sharing app can’t connect to a network location. But then I reminded myself, that I had an On-Premise Installation of AD RMS, and I might haven’t shut down correctly, since it is in my LAB, this can happen sometimes. 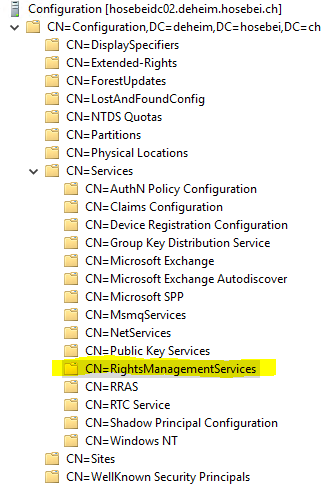 I went on a Domain Controller and opened ADSEdit.msc to checked the Service Configuration of “RightsManagementServices”. And there was an entry for my Onpremise RMS Service, in which I could find an URL that was no longer available. Afterwards, the RMS Sharing App worked like a charm.